La Belle Assemblée, June 1806. La Belle Assemblée began publication in February 1806. The price was 3s 6d per issue, and included hand-colored fashion prints. But for a reduced price of 2s 6d you could get prints in black-and-white. By 1808, only colored-print versions were available. I have 2 volumes from 1807 which have prints that are partially colored, eg one figure is black-and-white and one colored. This may represent some sort of interim stage before going full color. The print shown here is from a black and white issue. The prints in the first year of La Belle Assemblée’s production are beautifully drawn, and often by acclaimed artists and engravers. This print was drawn by artist Arthur William Devis, a painter of portraits and historical subjects, most famous today for his Death of Nelson. Over 60 of his paintings were exhibited at the Royal Academy. He fell into hard times and spent time in debtor’s prison. Shortly after his release, he began producing designs for the early issues of La Belle Assemblée. All designs attributed to him have such beautiful faces. As a portrait painter, he clearly had a good eye for faces. I have never regretted that this print is not colored, because I love the faces so much. 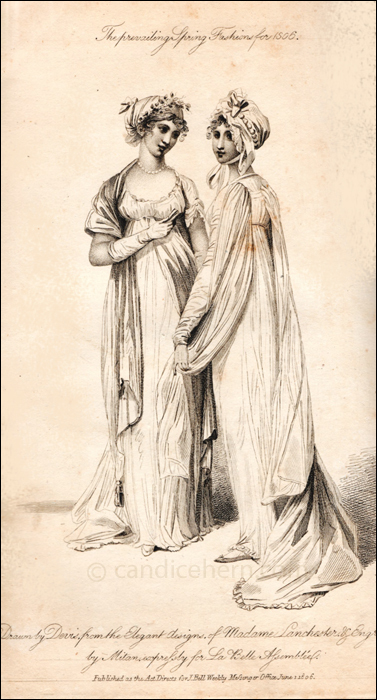 Madame Lanchester, who designed these dresses, was a famous modiste of the period. 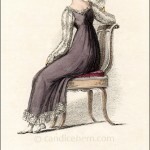 Many of her designs are represented among the prints on this website, including Walking and Riding Dresses of August 1800, and Opera Dress of March 1809. “Plate I. Fig. 1–Walking Dress. 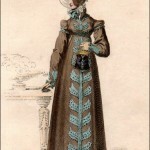 [shown on the right] Round gown of fine cambric muslin, with long sleeves, and trimmed round the bottom with double muslin. A cloak of fine clear muslin, bound round with white satin ribband. A white sarsnet bonnet, ornamented with white satin puffing. Grey kid gloves and shoes.